I got into the Math Trade for Unity Games, managing to swap 5 games, and subsequently purchase a 6th. The ease of this process has made me less reluctant to balk at questionable games. Giving up 5 games I would never play again for 5 that I either wanted or was interested in was a no-brainer once I put it to myself that way. 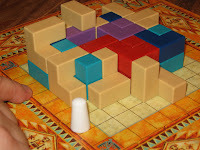 Pueblo is one of those out-of-print and generally unavailable games. I looked far and wide. I found a single copy in Halifax for $50 celsius + shipping + any customs cost and destruction. No thanks. It is unlike any other game in my collection, and I think the spatial nature of the game will be appealing to a wide range of players. Thanks, Michael. The Bridges of Shangri-La has been on my radar for a long time. I like Colovini games in general. Thanks, Richard. I was going to order Key Harvest in my next game order anyways. This came in shrink, yet was missing an orange piece. This is the second time I emailed Jay (RGG) late on a Sunday night and got an instant reply that my piece is on the way. Thanks, Richard. I've played Robber Knights once before and liked it. Unfortunately, this was actually the German version, Raub Ritter. The game is language independent, but I'm picky enough that I would not have put in the request if I had bothered to look at the version info clearly specified in the math trade. My fault. Thanks, Adam. Thanks to a random late-night game on BSW with melissa, my interest in Thurn & Taxis was rekindled. It's not a typical game for me, but I think it will get some play, if only at home. Thanks, Jay. I also purchased Augsburg 1520, which I've been reading about with fairly high interest. Thanks, Bob.